Finely chop the chives, garlic, 3 slices of ginger, 1 spring onion and coriander and place in a large prep bowl. Finely dice the mushrooms and prawns and add to the prep bowl with the pork mince. Season with soy sauce, a pinch of sugar and cover with sesame oil. Place 1 teaspoon of filling in the centre of each pastry, wet all sides of the pastry with cold water. Holding the base of the filling with your thumbs, pull the 2 corners of the triangle towards each other (in the school we like to call this the 'Dark Knight Rising' as it looks roughly like a Batman shape). Overlap the ends and press together to form a 'gold ingot/ trough shape'. Set aside and fold the rest of the wontons in the same way. Add oyster sauce and then pour in chicken stock. 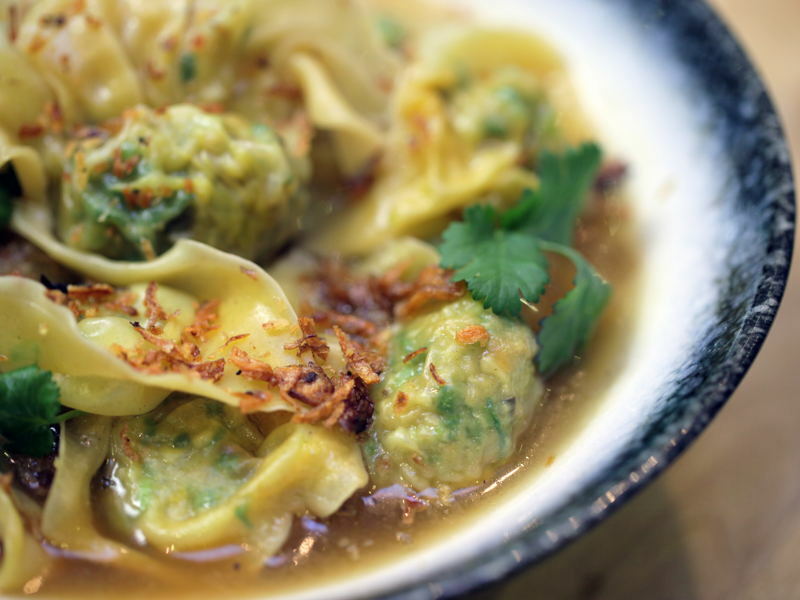 Boil for 3-5 minutes until all wontons are floating, then add the noodles to reheat.